Greetings to our San Bernardino Division fencers and all visitors, fencing and non, to our website. This Saturday, October 18, 2014, Hemet High School was the host venue for our San Bernardino Division 3-weapon open. WOW!!! This was an awesome tournament! Fourteen saber fencers, 19 foil fencers and 20 epee fencers. And every fencing match was a real barn-burner! Saber, of course, is made up mostly of the fencers from Desert Fencing Academy, but we always have Ken Calderone, from Swashbuckler, on hand to spice up the fencing action. In addition, we had Fint Jeffry from Swordplay in Burbank and then two sisters, Robyn and Jenny Song from Laguna Fencing Center and, of course, the saber fencers from Hemet High School. Barn-burners included the round of 8 bout between DFA saber fencers Cory Hutchinson and Sabrina Fletcher. The fencing was excellent and exciting and all the spectators were on their feet cheering. It came down to one touch with Cory and Sabrina tied 14-14 (la belle) in their saber D.E. with Cory scoring la belle touche! As the saber fencers were going through the table of 8 and then the semi-finals, it was Cory Hutchinson and Alec Steele tearing up all their competitors with the two DFA saber fencers meeting for the gold medal bout. Another barn-burner. Both boys fencing and fighting for all their worth with Alec reeling off the final touch to win it 15-12. Alec won the gold medal and earned his E2014 rating in saber, with Cory winning silver and the two sisters, Robyn and Jenny both tied for 3rd place. 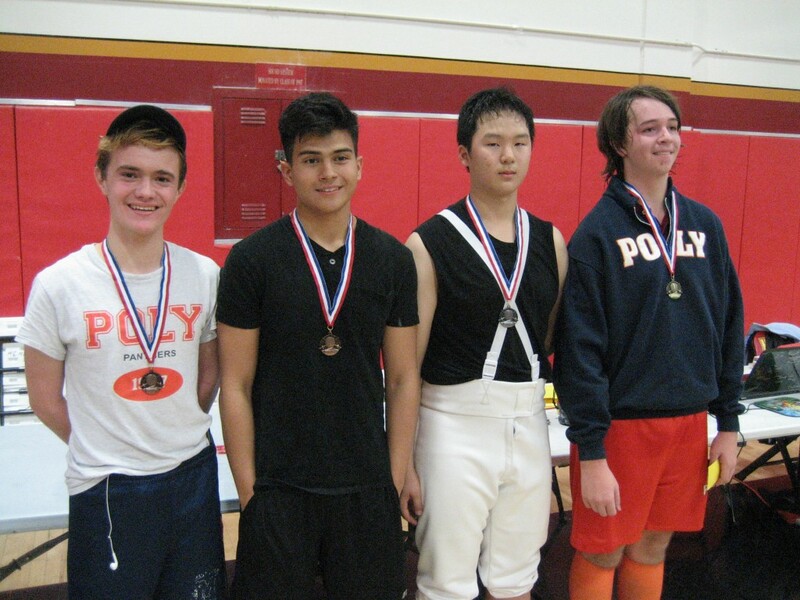 Foil had 19 fencers, 11 of which were from Poly Technic School, coached by Laura Holmgren. 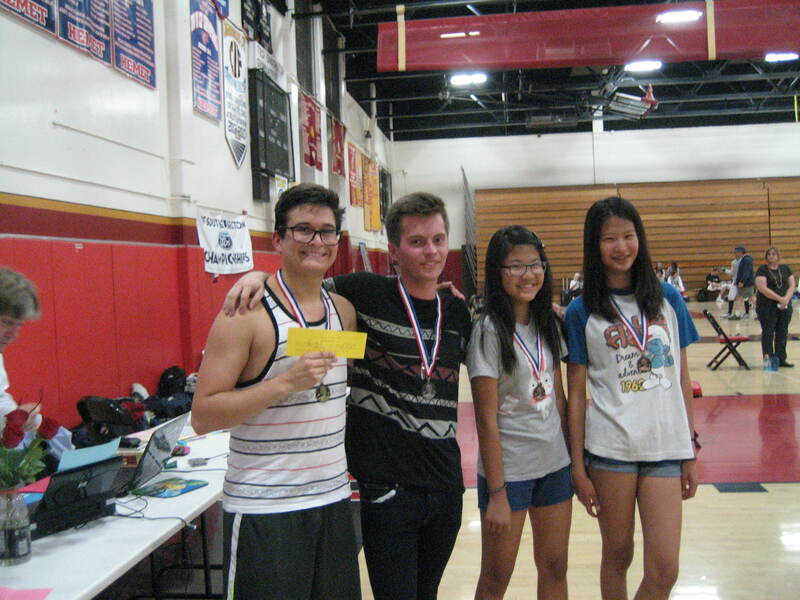 Other foil fencers were from Swashbucklers, Fortune Fencing and Hemet High School. 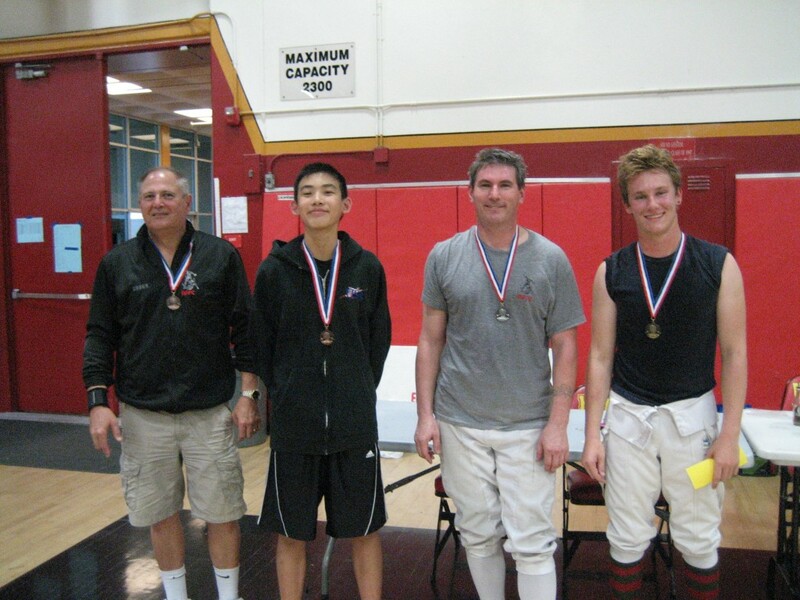 In fact, the fencing coach at Hemet High School, David Powell, competed in both saber and foil. Barn-burner with the foil fencers. Robert Gallegos, Swashbucklers, won all his pool bouts in his pool, Michael Hatch, Swordplay won all the bouts in his pool, followed by Stephan Park, Inland Fencing Academy, and Matthew Soulanille, Poly Technic. In the final round, fencing for the gold medal and earning his E2014, Matthew Soulanille defeated Stephan Park, 15-13. Stephan is from Korea and said this is his first fencing medal he has won in America! Tied for 3rd place were Michael Hatch and Robert Gallegos. And then there were the 20 epee fencers. The majority of the epee fencers were from No Fear, (San Diego), Desert Fencing Academy, (Palm Desert), Cabrillo, (San Diego), L.A. International Fencing Club, Fortune, Harvard Westlake and Swashbucklers. Barn-burners again. Father and son, Glenn King and Danny King, (DFA), met in the round of 32 with papa Glenn defeating his son. Then competition began heating up with the San Diego fencers, Chuck Alexander, Creston Bailey and Wyatt Sapiro (No Fear) and Frank Hewitt and Alessandro Sette (Cabrillo). In the round of 8, Sapiro defeated Sette, (15-14), Alexander defeated Alfred Roebuck (15-13) and Creston Bailey and Frank Hewitt had a barn-burner of a D.E. with Creston winning 15-11. In the semi-finals, Sapiro defeated Alexander 15-10 and Bailey defeated Kevin Chao 15-8. The gold medal bout was between No Fear club-mates Wyatt Sapiro and Creston Bailey. What an exciting bout! Both fencers going at each other. Final score, Sapiro 15 – Bailey 14. And Wyatt earned his A2014 rating! The fencing was exciting, exhilarating and great fun to watch. The entire atmosphere was one of fun, friendship and high-powered fencing.